Pots aren’t just something for a grower to put a plant in anymore. The presentation of the plant for the consumer — the container, sleeves and wraps, tags and signage, even a story — can be almost as important as the plant itself. It’s a trend we saw in full force at OFA Short Course this summer. “As container gardening’s popularity continues to grow, we are seeing an increased focus on growers selecting containers based on the end consumer’s preferences,” says Dave Edenfield, business development manager for McConkey. It’s a trend driven by many forces outside our industry, he says. Americans are living in smaller spaces, moving more frequently and have less space for a garden. Container gardening is a chance for them to express themselves without making the permanent commitment in the landscape. A beautiful plant is what first grabs that consumer’s attention, but a great complementary container can add extra value to it, says Stacey Rumph, key accounts manager for CTI Plastic. The fashion analogy is more than coincidental. 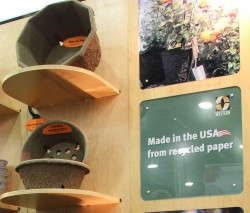 Design trends in these new consumer-friendly pots go beyond what’s currently popular in the garden center. Recognizing a potentially profitable color or design trend in another area is important, but sometimes, understanding what drives those trends can be even more valuable. “We often look to other industries that have responded to cultural changes successfully,” Edenfield says. “We see a lot of parallels with food. There’s a growing emphasis on being more connected with food and nature, but people are busier than ever. The food industry has responded with more gourmet-style, “foodie” products that still allow people to do part of the prep work and get the essential experience of cooking without the frustration. A relatively new term we’re hearing in garden retail merchandising and displays is “mannequin.“ Rather than build a standard end cap display of plants, smart retailers are pulling together different elements to create an “outfit,” as Rumph described earlier. The container is an important part of the presentation. “Just like any other retailer, you have to paint a picture for the consumer, and tell them a story, not just have random pieces thrown together,” Winslow says. It’s also important to understand seasonality, Rumph says. How can you take advantage of these trends for your plants? Even if you’re not directly involved in retailing, the first step is to understand who is buying them, or more important, who you want to buy them. Take advantage of the knowledge your container supplier can offer on these decisions, Rumph says. 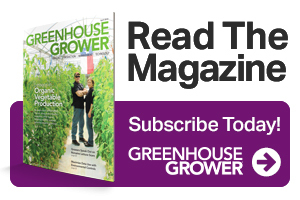 Richard Jones is Executive Editor for Meister Media Worldwide’s U.S. Horticulture Group, including Greenhouse Grower®, Greenhouse Grower® TECHNOLOGY, American Vegetable Grower®, American Fruit Grower®, Western Fruit Grower®, and Florida Grower® magazines. See all author stories here.